What comes to mind when you think of the Galapagos Islands? "They are famed for their vast number of endemic species and the studies by Charles Darwin during the voyage of the Beagle that contributed to the inception of Darwin's theory of evolution by natural selection." "Though the first protective legislation for the Galápagos was enacted in 1934 and supplemented in 1936, it was not until the late 1950s that positive action was taken to control what was happening to the native flora and fauna. In 1959, the centenary year of Charles Darwin's publication of The Origin of Species, the Ecuadorian government declared 97.5% of the archipelago's land area a national park, excepting areas already colonised. The Charles Darwin Foundation was founded the same year, with its international headquarters in Brussels. Its primary objectives are to ensure the conservation of unique Galápagos ecosystems and promote the scientific studies necessary to fulfill its conservation functions. Conservation work began with the establishment of the Charles Darwin Research Station on Santa Cruz Island in 1964. In 1986 the surrounding 70,000 square kilometres (43,496 sq mi.) of ocean was declared a marine reserve, second only in size to Australia's Great Barrier Reef. In 1990 the archipelago became a whale sanctuary. In 1978 UNESCO recognised the islands as a World Heritage Site, and in 1985 a Biosphere Reserve. This was later extended in December 2001 to include the marine reserve." And then, there's the Diving! Clouds of schooling Hammerheads, the resident pack of supersized Galapagos Sharks on that corner in Wolf, the funny Redlipped Batfish, friendly Black Galapagos Sea Turtles, mating giant Whale Sharks right in front of Darwin's Arch, boiling bait balls, wandering flocks of Silkies, flights of Golden Cownose Rays - pure magic! Well, it seems, not for long anymore. One year ago, in its wisdom, the all-powerful Darwin Station cancelled all of the popular two-week dive cruises, no reasons given. In brief, you can forget about any meaningful diving in Shark Heaven, Wolf and Darwin Islands. Then, it doubled the quotas of the fishermen operating in the area. In June of this year, UNESCO has added the Galapagos to its List of World Heritage Sites in Danger. One month ago, the Darwin Station withdrew the operating license of all diving vessels except for the two biggest operators. Again, no advance warning and no reasons were given, stranding scores of pre-booked tourists and causing untold damage to the reputation of the Industry. At the same time, huge foreign cruise ships are being allowed into the Archipelago, thus increasing pressure on the ecosystem. Now Rafael Correa, the President of Ecuador, in his wisdom, has repealed Decree 2130, the Law of 2004 banning the fishing, commercialization and exportation of Sharks. No reasons given of course. In the week following that decision, more than two tons of Shark fins alone have been seized, then released back to fishermen who claimed they had caught them as bycatch. In brief, the floodgates have been opened for the indiscriminate slaughter of Sharks in the Galapagos. Half of the 29 Shark species that frequent those waters are considered threatened. At the same time, Correa announced that he was expelling Sea Shepherd's Local representative in Ecuador, Sean O'Hearn Gimenez, who had organized the successful seizure. That unconstitutional attempt was successfully thwarted. What the Hell are those Morons doing? The Darwin Station has long been the laughing stock of the Conservation community. Its Galapagos Directorship is a revolving door and its policies are only noteworthy for their arrogance, incompetence and inefficiency. Millions in Park entrance fees are being squandered in its bureaucracy and their recent track record, as shown above, is abysmal. Need there be more warning than the move by UNESCO in June? When will the Board finally stop this pathetic travesty? As to Correa, what can I say. Everybody knows that the Shark Fin trade is a Mafia money laundering operation mounted by the Chinese Triads. Big money, and plenty enough to buy the President of an impoverished thirld world country. And, it's election time. Several organizations, among them Sea Shepherds, The National Geographic Society, Peter Hughes Diving ( phddivemail@waterpath.com), my friend Dom of DiveAdvice (dom@diveadvice.com) and Wild Aid through its local representative Oswaldo Rosero (oswaldo.rosero@gmail.com) are organizing public letter campaigns addressed to Correa, requesting him to reverse his decision. Please, if you care, write such a letter and show this blog to your friends. "Ecuador is a sovereign nation, and most of us are not citizens of Ecuador, so please be cordial in requesting President Correa's help." Coral reefs in the Indian and Pacific Oceans are dying off much quicker than previously thought, a new study shows. For the last two decades, Indo-Pacific reefs have shrunk by 20 percent —a loss equivalent to nearly 600 square miles (1,553 square kilometers). That makes the rate of reef loss about twice the rate of tropical rain forest loss. 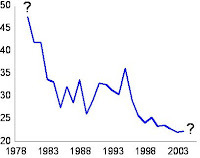 The research also revealed that the decline began in the late 1960s—much earlier than had been assumed. "Twenty or 30 years ago reefs with a high cover of coral were fairly common," said study co-author Elizabeth Selig, a marine ecologist from the University of North Carolina. "Today there are comparatively few reefs in the Indo-Pacific that we would traditionally think of as being pristine." 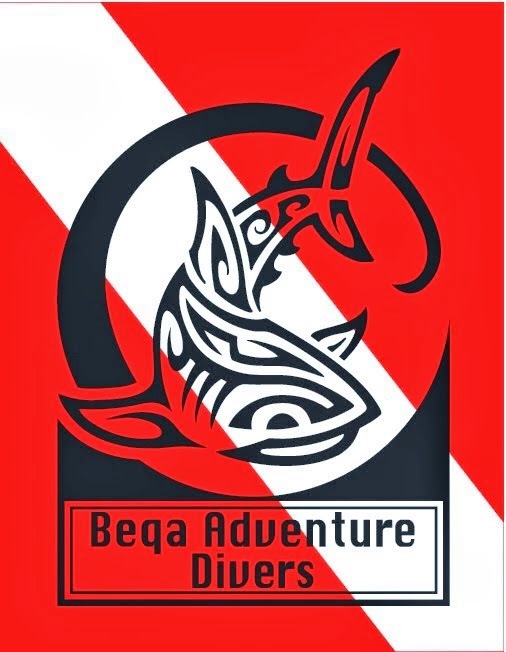 It's many divers dreams to be able to witness up close and personal one of the ocean's top predators and it does not get much bigger or better than a tiger shark encounter. We are fortunate that we get to dive with these majestic animals on a regular basis but even we still get excited when a tiger shark turns up on one of the dives at Shark Reef. However, there's no greater feeling than the post dive high of diving with a brand new shark, no matter the species. 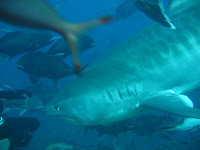 In June, we were blessed to have an encounter with a new, small tiger shark about 9ft in length. Well, good news, it seems that she has decided to make the local waters her home for a little while. 'Brat', as she has been affectionately named, returned again in July for another visit during our first ever Shark Studies trip with Academic Treks. On this encounter she cruised around Shark Reef for about 20mins and everybody managed to get a really good look at her. One of the participants, Simon Rivard, managed to capture some cracking images of Brat; congratulations Simon. We hope this is not Brat's last visit to us and there are many more to come.